This inspiring piece of awareness jewelry will instill hope in all who care for and love someone with autism that one day, there will be a way for their loved one to overcome all of the obstacles that they face. 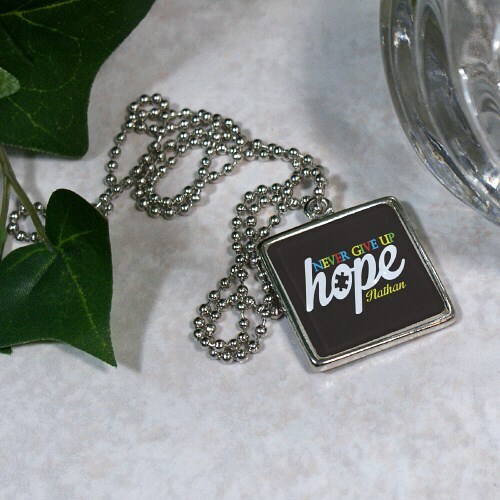 This beautiful Hope design will promote positive thinking and action in regards to treating and overcoming any obstacles associated with autism.This Pendent is a silver-plated square frame that features a 1” Crystal insert. It's printed with our Autism Awareness Hope design. The Crystal Pendent hangs from a silver-plated Ball Chain Necklace, measuring 23” long. Free personalization of any name is included. Additional Info Give this stunning autism awareness gift to a family member or friend who is passionate about educating others about the autism spectrum. They'll appreciate having a token that shows off their friend or loved one with autism. Our Autism Awareness Key Chain is another fantastic gift option.